A swimming pool for cockroaches. What am I referring to? Milton's water bowl. Over the course of the past two weeks, I have seen three, count them THREE, gigantic cockroaches in our apartment. Saturday night, one of them even made skin to skin contact with me on our couch - shocking, horrific, and utterly traumatizing. Really. Cockroaches destroy me. Do we live in a slum? Are we eating off the floor using our feet for utensils? No, absolutely not. Do I feel like I have the stigma of "Roach" stamped on my forehead now? Yes - 100%. My question is - why us? I meticulously clean, diligently remove the trash, and religiously run the dishwasher and washing machine. The nasty, little creatures are targeting us, and I think I know why - the Milt. To be more specific, the Milt's water bowl. The scorching hot weather in Texas has left us in a drought with these buggers creeping and crawling in search of something to slake their thirst. From now on, no unmonitored water will be left out. None. Neither a drip nor a drop unless we are supervising the Milt while he drinks it. 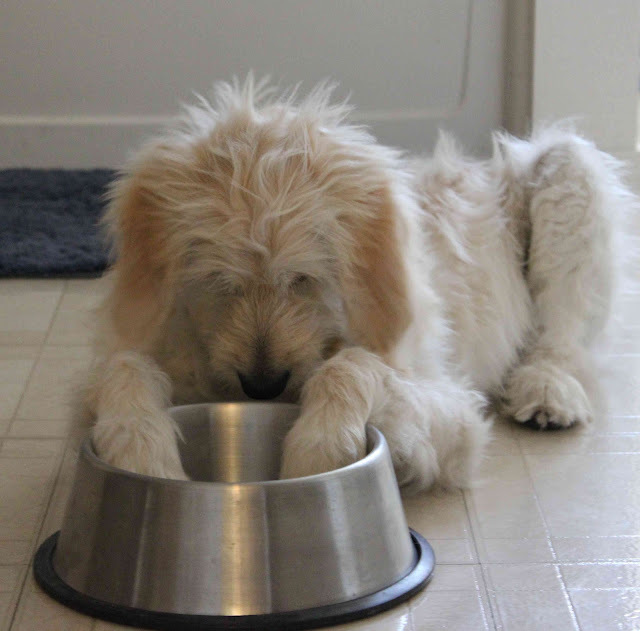 If this goldendoodle gets thirsty, he makes it known. Milton paws at his bowl for water to magically appear, he barks loudly for us to dole some out, or he hauls himself up to peer into the bathtub for any stray puddles. "What happened to all the water, Momma?" I've sprayed, and I've prayed. These roaches cannot stay. Remember: sleep with your mouth closed. And cover your ears while you're at it. I don't mind dealing with a decomposing body but get a roach within 50 yards of me and I scream like a girl. You...are...SO BRAVE!